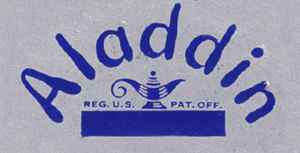 US label launched by brothers Eddie Mesner and Leo Mesner in Los Angeles, CA in February 1946. Previously known as Philo Recordings, the name had to be changed because of the similarity to radio manufacturer Philco, who at that time was thinking about starting a record division. The Mesners sold the entire Aladdin catalog to Lew Chudd's Imperial Records on February 12, 1962. The brand was revived in 1974 by Billy Hancock and his brother Dale. Today the Aladdin catalog is owned by Universal Music Group. The Mesner brothers later helped found the Dig Records label with Johnny Otis. Note: Intro Records (3) 45 singles have similar matrix id's on labels. For unofficial releases, see Aladdin (8). 3260-3399 (1954-1957): Maroon label (excepted a blue label on 3338). 3400 and higher (1957 forward): Black label. Opaque green vinyl exists for 3097, 3104, 3128 / Opaque red vinyl for 3144.